Hanover - Hannover 96 and Borussia Dortmund have each penned particularly positive chapters in their respective histories over the past couple of years and both are intent on continuing their upward trend in Sunday's meeting at the at the AWD-Arena (kick-off 15:30 CET). 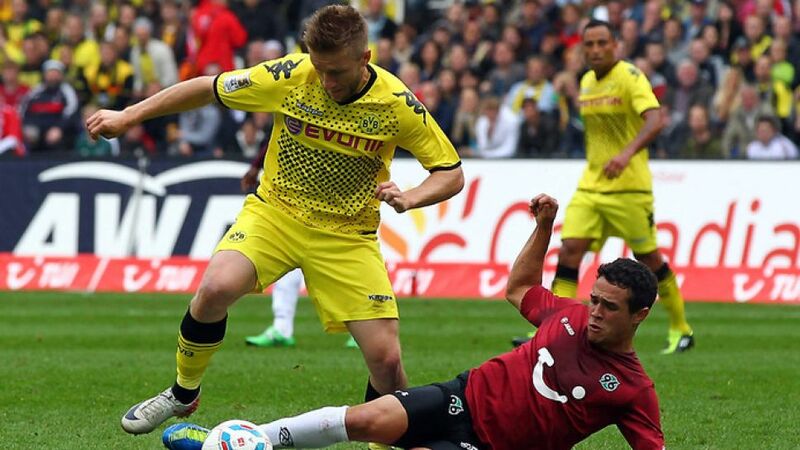 Dortmund are back in the hunt for a third consecutive title following their 5-0 demolition of Borussia Mönchengladbach last weekend, while Hannover are challenging for a third straight season in Europe. Marco Reus' goal against Manchester City in the UEFA Champions League on Wednesday showed the world what Germany has known for several years already: that Dortmund have the quality to wreak havoc on any defence. Reus will be representing Germany next Friday night when they tackle the Republic of Ireland in Dublin, but before he trades yellow for white the nippy winger is eager to add to his Bundesliga tally in Hanover. Fellow German international Ron-Robert Zieler is the man charged with stopping him, and the former Manchester United goalkeeper knows exactly what to expect not just from his compatriot, but also from the rest of the Dortmund attack: "I saw their game against Manchester City and that was certainly an impressive performance," said Zieler. "This will be a game between two very good teams, but of course we want to win it." Hannover have trump winger of their own in Szabolcs Huszti. The Hungarian star is currently the Bundesliga's most effective player with three goals and seven assists to his name, contributing to over two thirds of his side's total strikes. Indeed, the one match he missed this season due to suspension resulted in a 3-1 defeat at 1899 Hoffenheim. Hannover come into the game on the back of a 2-1 win over UD Levante in the UEFA Europa League on Thursday, a game in which Huszti was again on target. "If we do everything right, then we'll be up to full strength again on Sunday," said head coach Mirko Slomka, whose only concern is the physical condition of his side after a run of five games in 14 days. "It's particularly motivating playing against the defending champions, though," he added. The Reds have not been beaten at the AWD-Arena in 21 Bundesliga matches - including a 2-1 victory over Dortmund early last term. "I can remember some spectacular duels between us," said Dortmund coach Jürgen Klopp. "If it weren't for us, then Hannover would be the biggest revelation in the league."